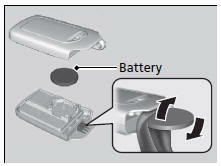 NOTICE An improperly disposed of battery can damage the environment. Always confirm local regulations for battery disposal. Unscrew the cover with a small Phillipshead screwdriver. 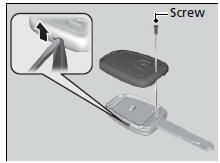 Remove the button battery with the small flat-tip screwdriver. Make sure to replace the battery with the correct polarity. 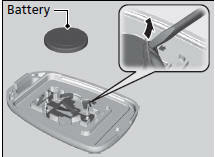 Remove the upper half of the cover by carefully prying on the edge with a coin. ► Remove carefully to avoid losing the buttons. 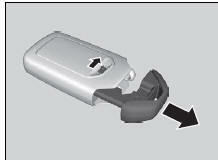 ► Wrap a coin with a cloth to prevent scratching the smart entry remote.